November is well-known as Lung Cancer Awareness Month. It is also the month that highlights awareness of less publicized forms of cancer including pancreatic cancer and stomach cancer. All three of these diseases share a common risk factor — cigarette smoking. Fifty years after the first U.S. 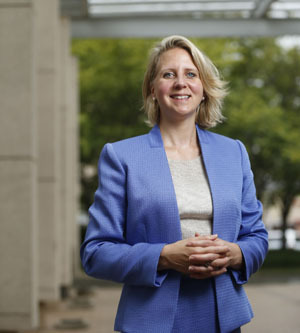 Surgeon General’s historic report that linked tobacco products to lung cancer, Vanderbilt has recruited Hilary Tindle, M.D., MPH, as director of Tobacco Research and Treatment. Tindle is a well-known tobacco researcher who contributed to the 2014 50th anniversary Surgeon General’s report. In addition to cancer, smoking also leads to cardiac diseases by hastening plaque buildup in blood vessels, or atherosclerosis. Tobacco use is costing the U.S. $300 billion annually in health care costs and lost productivity. These societal costs are not geographically uniform. States like Tennessee and Kentucky still have some of the highest percentages of smokers, which may contribute to the region’s designation as the Stroke Belt and the Cancer Belt. Tindle said eight in 10 smokers see a doctor annually and seven in 10 want to quit smoking. Over half of smokers actually try to quit every year. But most don’t use quit aids like nicotine replacement products, prescription medications or counseling programs and, as a result, 95 percent of unaided quit attempts fail. Over the next year, VUMC will create and implement the new patient-centered tobacco control program which will include education for providers and staff. The program will include assistance to patients while they are hospitalized. Tindle said there are already compelling signs that Americans are willing to make lifestyle changes regarding tobacco use.